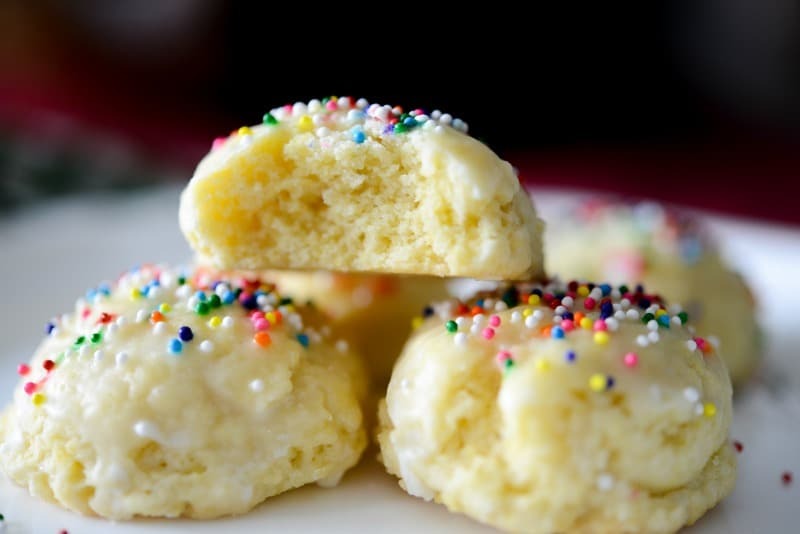 Italian Anise Cookies traditionally are a soft, licorice flavored cookie covered with a powdered sugar glaze and nonpareils sprinkled on top. It always amazes me how much food plays an integral part of our lives. Not only for nourishment, but it also helps define who we are. As I get older, I can recall certain memories from my youth where others are completely lost until I smell a familiar scent or eat something I used to like as a child. When my husband’s Italian aunt passed away a few years ago, her children made a recipe book with some of her favorite recipes. 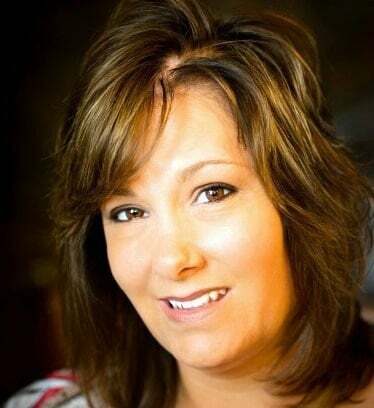 She was an amazing cook and like most Italian women I know, there was always food and drink ready at the drop of a hat; always ready to entertain family and friends. One of the recipes in this book was for her Anise Cookies; which I couldn’t wait to make. 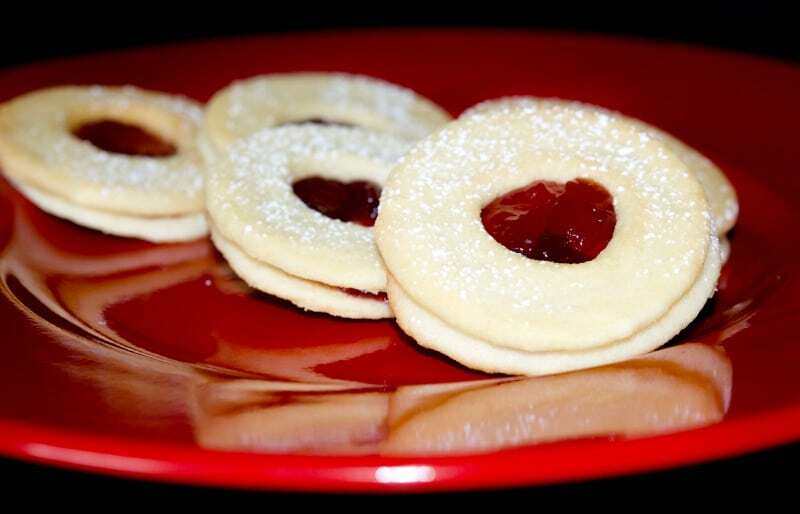 She always had these cookies on her Christmas cookie platter and they were one of my favorites. 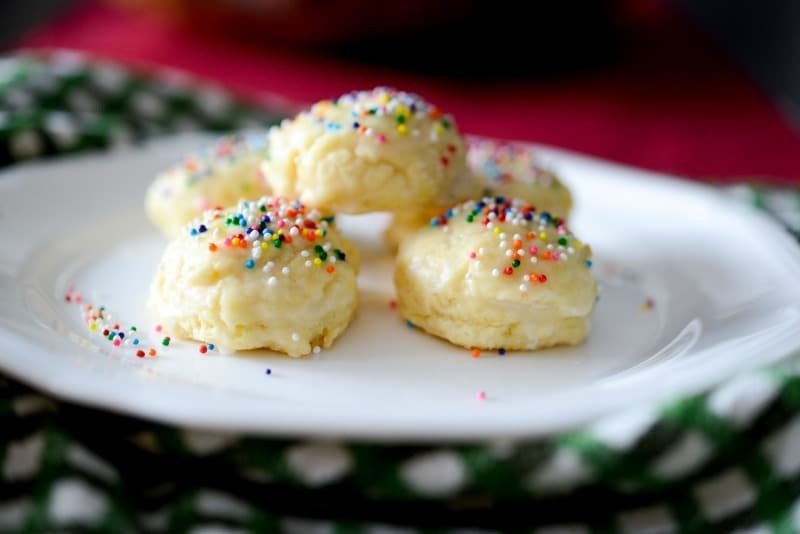 I also liked them because it brought back memories of me being a small girl and eating them with my sister and cousins at my own Italian grandmothers house during the holidays too. See, food does bring back memories! These Anise Cookies are delicious and so easy to make. The last two years I didn’t have much time to bake for the holidays, but was happy this year when I was able to spend a day and a half in the kitchen making my favorites like Walnut Crescents, Bailey’s Irish Cream Truffles, decorated sugar cookies, oatmeal raisin cookies, Cinnamon Walnut Pinwheels, and even made a new biscotti recipe. We had Christmas music playing and the girls were decorating a Gingerbread House; it never gets old! 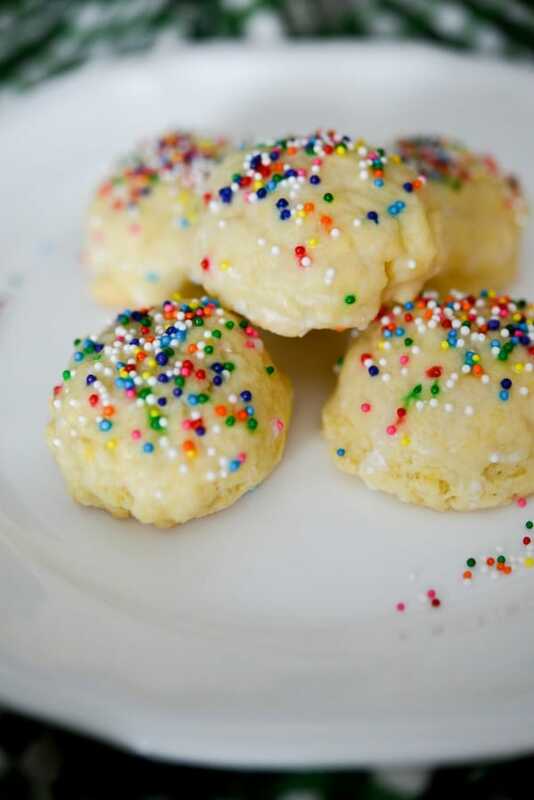 For this recipe you’ll need flour, baking powder, sugar, eggs, butter, anise extract, milk and confectioners sugar. Start by adding all ingredients except the confectioners sugar and milk to your mixer; then slowly blend until the dough forms. Line a baking sheet with parchment paper or Silpat mat and drop 1 tbsp. of the dough onto the pan. 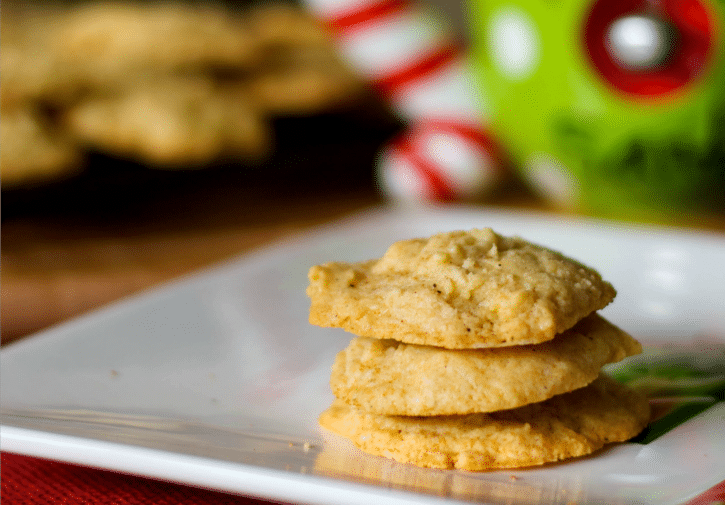 The cookie won’t spread much so you can place them about 2″ apart. Bake at 350 degrees F for about 10 minutes or until the bottoms turn a light brown. Remove the cookies from the oven and allow to cool for 5 minutes before transferring them to a wire rack to cool completely. 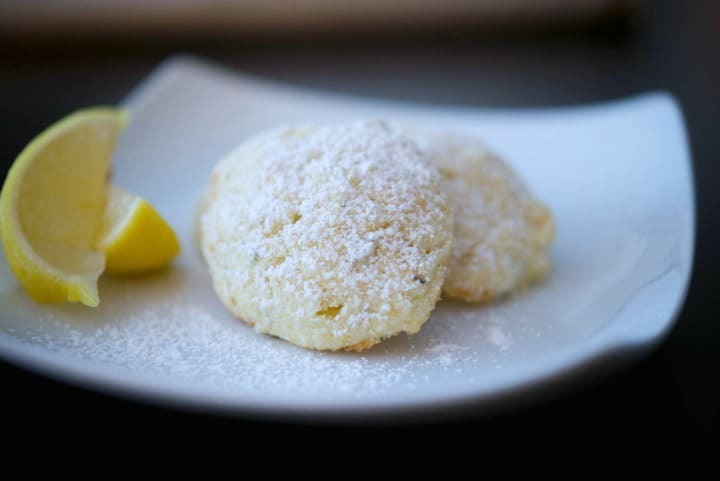 Once the cookies have cooled, combine the confectioners sugar, anise extract and milk in a small bowl and mix until the sugar is smooth. Dip the top of the cookie into the sugar mixture, place back on the wire rack; then sprinkle with nonpareils. I like to dip about three to four cookies; then sprinkle because you want to make sure the sugar is still wet so the nonpareils will adhere. 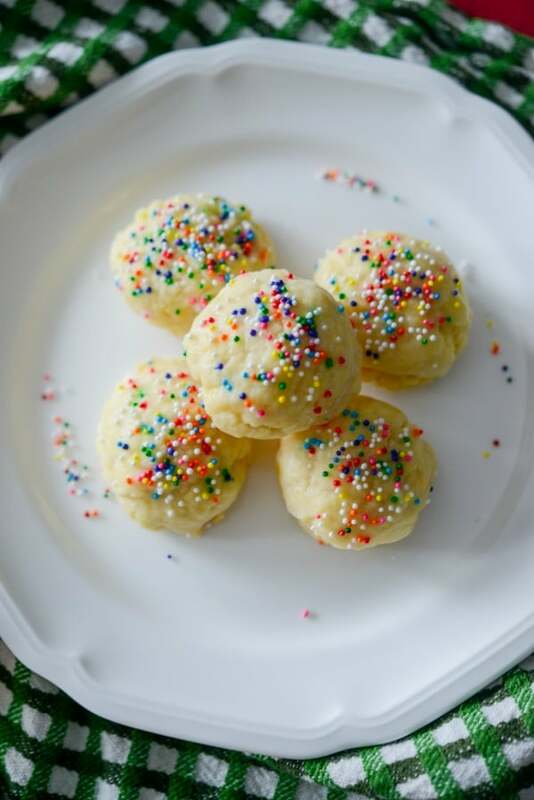 You can store these Anise Cookies in a tightly sealed container or cookie tin at room temperature for about one week or I prefer keeping them frozen in a resealable bag so that they stay fresh longer (about 4 months). It helps ensure that my cookies are fresh when making trays of holiday cookies to bring as hostess gifts. ~Enjoy! 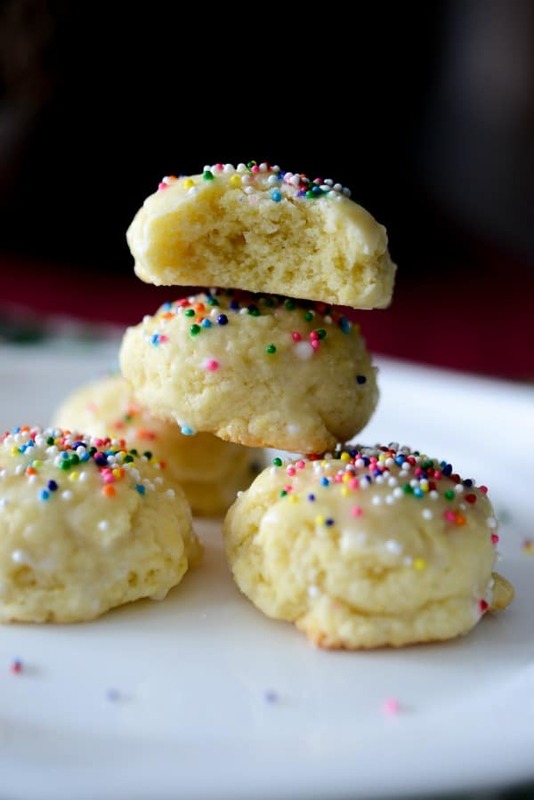 Italian Anise Cookies traditionally are a soft, licorice flavored cookie covered with a powdered sugar glaze and nonpareil's sprinkled on top. Start by adding all ingredients to your mixer; then slowly blend until the dough forms. Bake for about 10 minutes or until the bottoms turn a light brown. Remove the cookies from the oven and allow to cool for 5 minutes before transferring them to a wire rack to cool completely. 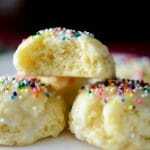 Combine the confectioners sugar, anise extract and milk in a small bowl and mix until the sugar is smooth.